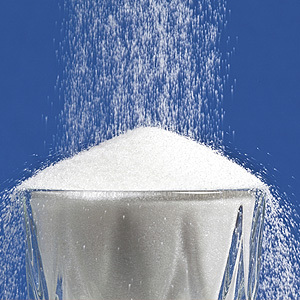 The market for sugar alternatives has grown exponentially since saccharin was accidentally discovered in 1878. Today, saccharin has been joined by other FDA-approved zero-calorie artificial sweeteners, including aspartame (“Equal®” or “NutraSweet®”), sucralose (“Splenda®”) and rebaudioside A, derived from the stevia plant. You can also choose low-calorie alcohol sugars like erythritol or xylitol. With rare exceptions, all these choices are widely considered safe substitutes for table sugar, high fructose corn syrup or other versions of this plentiful carbohydrate. Finding substitutes for sugar is a worthy health goal: besides its role in obesity, sugar is considered a contributing factor in cardiovascular disease and diabetes. It's also a prime food for oral bacteria that cause dental disease. As bacteria consume sugar they produce acid as a byproduct. Acid softens and dissolves the mineral content in enamel, leading to erosion and the formation of cavities. While saliva normally neutralizes acid after we eat, constant snacking and higher quantities of sugar in our food make it difficult for it to control or neutralize acid in the oral environment. Because most of us are hard-wired with a “sweet tooth,” it's difficult for many to cut back on sugar. Artificial sweeteners help reduce the amount of sugar in the diet with obvious benefits for general health. It can also make a big difference in your dental health by helping you prevent tooth decay. One alcohol sugar may even go a step further. In addition to reducing the presence of sugar in the mouth, xylitol (found in chewing gums, candy and breath mints) also seems to reduce bacterial growth by interfering with their ability to ferment the sugar. If you're considering using an artificial sweetener, get to know them first: some like aspartame aren't suitable for baked goods or cooking, while saccharine or sucralose are. People with a rare genetic condition called phenylketonuria also can't properly process aspartame in the body. Be sure you also talk to us about artificial sweeteners' impact on oral health, especially the benefits of xylitol for dental care. Used in a wise and informed way, these sugar alternatives can improve both your oral and general health.